According to ESPN, Jose Mourinho is keen to bring defensive reinforcements and shore up the leaking Manchester United backline in the coming winter. 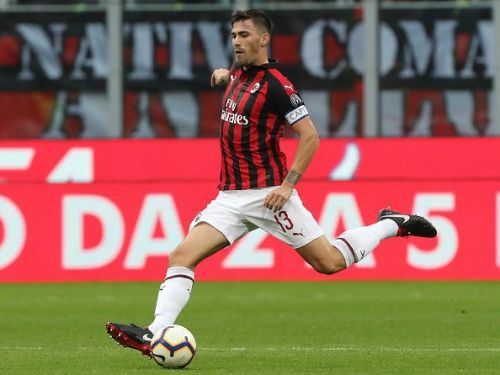 The Portuguese tactician is said to be plotting a move for AC Milan and Inter Milan center-backs Alessio Romagnoli and Milan Skriniar respectively. Both defenders are 23 right now and are valued in the region of £40 million. The defensive duo will also be eligible to play for the Red Devils in the Champions League this season if they succeed in signing them. "What matters is the team and all of us being focused on what we need to focus on, which is winning games, rather than contracts or any topics that can be a distraction. What matters is focusing on football. We have an important game against Everton and we have some big fixtures over the coming months." "I think that’s what matters, rather than thinking about anything else. I’ve been here for many seasons, as we’ve said. I’ve been at the club for eight seasons now. I’m very happy here. I always feel that warmth from the fans and everyone who works at the club." Former Manchester United captain and legend Eric Cantona has placed doubts over Jose Mourinho's style of management. The Frenchman believes that the Special One isn't the right man to manage the club. "It's not the right man for the right woman. It's the way you play. You can lose games but you take risks. You lose against Juventus and they have 70 per cent possession of the ball at Old Trafford. Could you imagine that with Ferguson on the bench?" "I suffer and I suffer even more when I see Manchester City play so wonderfully. I think kids need to have an example. They need great players, great movements, creative football to identify themselves to a player or a team. And I think they are now losing a generation of young players." Manchester United, who sit 10th in the table with 15 points from nine games, will host Everton at Old Trafford in the Premier League on Sunday.